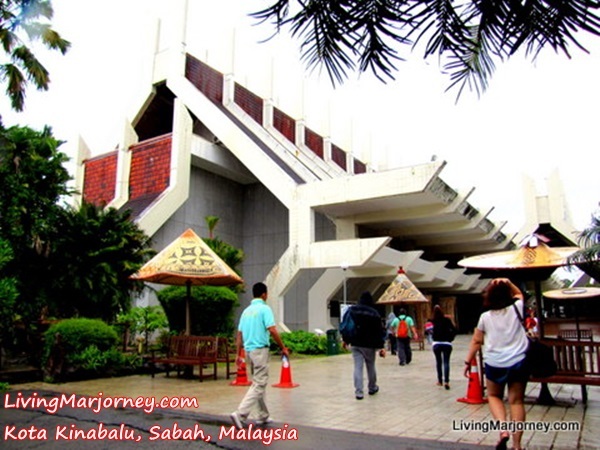 Places to Visit in Kota Kinabalu City, Sabah | Let's Go Sago! Right after landing from the inaugural flight of Zest Air to Kota Kinabalu, we excitedly followed our planned itinerary despite the the heavy rains which greeted us. First in our list is shopping and visiting gadget centers in Kota Kinabalu City. Our first stop was a short trip to Cocoa Boutique for packs of chocolate pasalubong (return home gifts). Yes, we are already concerned for pasalubong from the first day. They had my favorite variants such as hazelnut, almond, durian and the best-sellers tiramisu. Hot Chili and Cool Mint were quite interesting as well but it was spicy beyond my capacity. Later in the afternoon, we visited Sabah Museum which houses symbolic artifacts such as the biggest bryde whale skeleton, wood made megalith, suluk hats, and opium pipes. A 1953 dinner set was also displayed in the gallery in addition to Malaya & British Borneo currency , books, and Istana Cutlery. You’ll find a diorama of coffins from Agop Batu Tulog and Gua Cave. The traditional pottery and basketry are also displayed in the museum. At the 3rd level, a replica of Sumatra Rhino (Borneo’s smallest elephant), the leopard cat, and the smallest bear called Malaya bear, can be found. There are collections of jars and traditional costumes. The familiarization tour brought us back in history and gave us a background of the country’s cultural heritage. To cap the day, a scrumptious dinner was served at Kg Nelayan Restaurant floating restaurant serving fresh and live seafood. We were also joined by Sabah Tourism Board and Zest Air officers. From the dishes we had, I recommend the crispy crabs and the steamed fish. While enjoying our food, everyone was also enjoying a cultural dance performance. The shopping centers are few minutes away from our hotel, Pacific Sutera, and many other hotels in the city. Although there are fewer shopping centers in the city compared to Kuala Lumpur, I still found interesting pieces perfect for “pasalubong” and some souvenir items which I bought from Sabah Museum. Seafood is what you should go for in Kota Kinabalu, for which they are known for. Moreover, most of the curry dishes are milder in spice compared to those served in Kuala Lumpur. Or maybe it was just me. Although expecting a teh tarik, I had a honeydew drink in Kg. Nelaya, instead. We extend our thanks to Zest Air, in partnership with Air Asia, and the Sabah Tourism Board for this tour of Kota Kinabalu City.